This wonderful blue flowered Dendrobium species is a cool growing epiphyte, native to the Philippines where it grows on moss covered trees in consistent moisture all year round and good air movement. 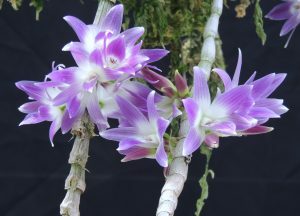 It is a free flowering species, but the peak of its flowering seems to be in June when it produces the first flush. The flowers are held normally in clusters of 3-4 but we have known our plants to produce up to 7 on its very short spikes. The flowers of this species are famous for being blue but the quality of the blue does vary. We have two different plants of very different flower colour. The smaller of our plants produces flowers of quite a dark blue. The larger of our two plants is the most vigorous and floriferous clone we have seen with the plant smothered in flowers this week. 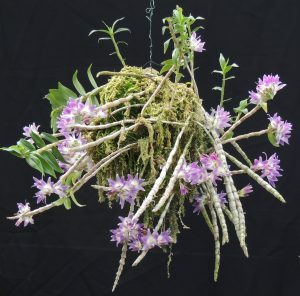 The plant grows in the side of a moss covered basket where it is kept wet all year and hangs in Cool Asia (min 10C). This potting method was developed by Jacob and certainly seems the way to grow this orchid to perfection.